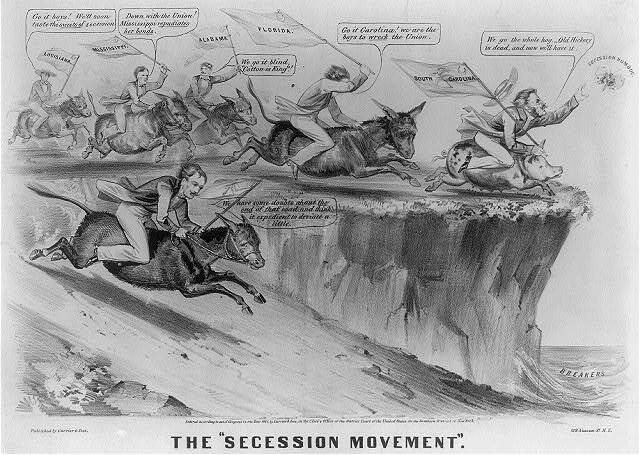 On January 19, 1861, by a vote of 208 to 89, Georgia’s secession convention delegates, meeting in Milledgeville, declared their independence from the United States. Thus, Georgia became the fifth state to secede, following South Carolina, Mississippi, Florida, and Alabama. “For the last ten years we have had numerous and serious causes of complaint against our non-slaveholding confederate States, with reference to the subject of African slavery. They have endeavored to weaken our security, to disturb our domestic peace and tranquility, and persistently refused to comply with their express constitutional obligations to us in reference to that property, and by the use of their power in the Federal Government, have striven to deprive us of an equal enjoyment of the common Territories of the Republic. To ensure that there would be no misunderstanding regarding the reasons that compelled Georgia to leave the Union, the secession convention printed and distributed 10,000 copies of the declaration.